Chester seems to be on his best behavior. After being kicked outside for causing a scene, he has miraculously reformed and left the bunny alone. At least, that is what he wants everyone to think. Harold begins to suspect that something is wrong when there are no new vegetables being found without their colors in the morning. It is not until he comes downstairs during the night to find Chester guarding the kitchen door with garlic that he begins to get an idea of how far Chester is willing to go. Harold discovers that Chester is swiping the food that is being left for Bunnicula. The poor little bunny is hungry, and is becoming sick from the lack of food. While Harold will follow Chester to a point, he has decided that he has had enough. Seeing a large salad on the dinner table, an idea springs into his head. He will have to be fast though if he is going to keep Chester in the dark. He carefully gets the bunny to the table, and urges him to eat, but Chester is onto them. Just as Bunnicula is ready to dive into the food, Chester springs across the table and chases him off. Not knowing what else to do, Harold begins to bark, alerting the rest of the family to the little brawl going on. Now that the Monroe’s can see that Bunnicula is sick, Chester and Harold are rounded up as well for a visit to the veterinarian. The vet tells the Monroe’s that Bunnicula is just hungry, and puts the bunny on a liquid diet that suits the pet perfectly. Harold is spared his shots, and Chester? Well Chester is in for his own little doctors visits…..
Are you surprised at the lengths that Chester has taken with Bunnicula? 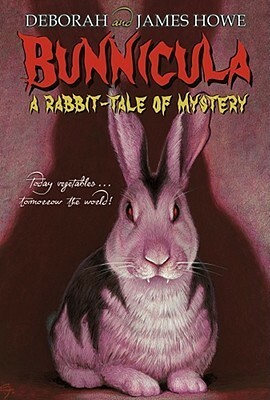 Does Harold taking pity on Bunnicula surprise you? Why do you think liquids work best for Bunnicula? « Add Some CREEPY and CRAWLY to your porch with YARN! !